Two-goal Bretton North End boy Kyle Orange (yellow) is beaten in the air by a Stanground Sports defender. Photo: David Lowndes. A single first-half goal from Liam Harrold helped Peterborough Premier Division title challengers Whittlesey Athletic avoid a potential banana skin at Pinchbeck United on Saturday (February 13). Harrold’s strike was wnough to seal a 1-0 win and move Whittlesey to within three points of unbeaten leaders Moulton Harrox. That’s a mis-leading margin though as Harrox will receive three points in the future from their scheduled game at Deeping Rangers Reserves which was postponed after the hosts disappointingly called off the match after failing to raise a team. Action fron Bretton North End's 3-2 defeat to Stanground Sports (dark shirts). Photo: David Lowndes. Third-placed Peterborough Sports Reserves are still in contention at the top after predictably beating Langtoft United 2-0 at PSL. Gary Gibbs and Adam Ricardson scored the Sports’ goals. Ketton are up to fourth after demolishing bottom club Riverside 6-0. Lewis Morley scored twice. 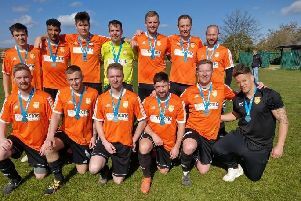 Netherton backed up their Northants Cup heroics by winning 3-0 at ICA Sports with goals from Herbie Panting, Tom Randall and evergreen Ronnie Fortune. ICA’s Lewis Glover was sent off early in the game by rising refereeing star Ryan Allison. In-form Uppingham Town stretched their unbeaten run in the Premier Division to nine matches with a 2-0 win at Sawtry, while Crowland completed back-to-back wins for the first time this season (without conceding a goal) by seeing off Stilton 2-0 with goals from Ian Walker and Sean Treagus. That means AFC Stanground are back in the bottom three after losing 3-1 at Thorney. Leverington are next to bottom after losing 6-1 at Holbeach United Reserves. There was a stormy top-of-the-table game in Division Three as leaders Bretton North End were beaten 3-2 at home by Stanground Sports. Ricki Goodale of Stanground was sent off for dissent and others were lucky not to join him. Kyle Orange scored both Bretton goals. Postponed: Deeping Rangers v Moulton Harrox (Deeping failed to raise a side).